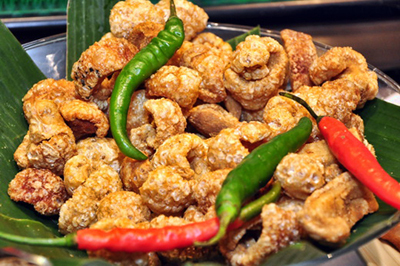 A favorite pulutan (finger food to accompany beer or cocktails), especially when freshly cooked and dipped in a refreshing vinegar sauce. Also available ready-to-eat in packets in Filipino stores. 1 Prepare the Garlic Soy Vinegar Dip. 2 Preheat the oven to 300°F (150°C). Boil the pork rind squares in the water and salt for 30 minutes, then drain in a colander. 3 Arrange a layer of the boiled rind on a baking pan and bake on the middle section of the oven for 3 hours. Remove the baked rinds from the oven and set aside to cool. 4 Heat the oil in a wok until very hot. Deep-fry the baked rinds over high heat until they puff up, then remove from the oil with a slotted spoon and drain on paper towels. 5 Serve with a bowl of Garlic Soy Vinegar Dip on the side.